Applications may be picked up in person, completed online or downloaded and printed from the STM website. The completed application and the $55 (non-refundable) application fee are required before applications can be considered. Applicants for grades 1-8 must also provide the most recent report card and test scores. 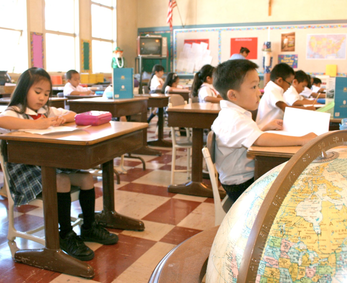 Catholic students entering 1st grade must present an original copy of their baptismal certificate. All applicants in grades 1-8 will be tested for grade suitability. There is no specific deadline. When a class is full and we do not expect to accept any more students, we will accept applications only for the waiting list. Depending on the circumstances, kindergarten applications received after mid-February, will likely be placed on the waiting list. Children currently attending Utopia, our preschool, as well as those who have siblings already in the school, will be given preference for enrollment. Catholic applicants will be given preference over non-Catholics. Families with more than one child applying to the school often receive special consideration. All applicants must be proficient in English in order to be considered for enrollment. Other criteria we look at in considering applications are a family’s connection with the school, the time and talents they are willing to share with the school community as well as their participation as an active member of the St. Thomas More Church community or their local church community. The completeness of the application and the timeliness of its submission is also a consideration in all grades. When will we be notified about the status of our application(s) to other grades? After students have been evaluated and tested by classroom teachers, applicants in grades 1st-8th will be notified of their status within two weeks of the test date. You will be given a deadline, approximately two weeks, to submit the appropriate fees to hold your child’s seat. These fees are non-refundable even if you change your mind and do not send your child to the school for any reason. If the office does not receive the fees to hold your child’s spot by the stated deadline, the seat may be offered to another applicant. Because of the number of applicants, some children may be wait listed. Certainly there will be many wonderful families and children put on the waiting list at least initially. Our experience has been that openings develop even up to the beginning of the school year. When that happens, we reconsider all the applicants on our waiting list. The waiting list is not ranked and we will choose the best applicant from those available. We do not know when those vacancies will occur or how many we may have during this process. We only know that we will have some changes and additions.